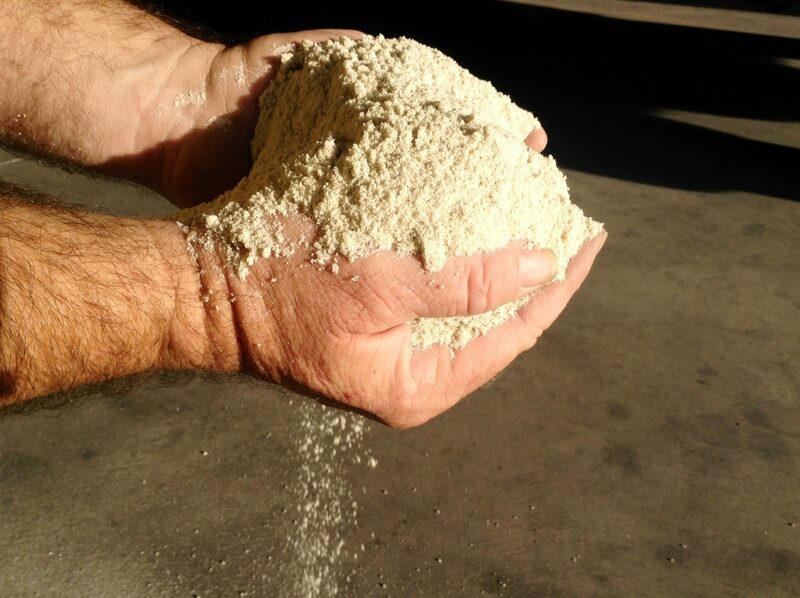 Voight Contracting can supply and deliver bulk natural Gypsum and other products to address your hard, heavy or sticky soil issues. We also have equipment and staff to spread, incorporate and mix materials into the treatment areas. Drying and amelioration of soils can also be undertaken by our staff and equipment. We will work in accordance with your Soil Management Plan (usually provided to you by soil analysis specialist) and ensure that the correct amount of gypsum (or other) is spread or mixed into the soil at correct depths, along with ensuring correct area coverage. Heavy sticky clay soil is difficult to cultivate. It is slippery and boggy when it’s wet, forms large clods and is extremely hard to penetrate when it’s dry. It has slow water filtration, meaning water sits on the soil’s surface and little water actually penetrates effectively into the ground. Water tends to pond or run off. Germination can be patchy and root growth is usually very poor ‘burning off’ early due to running out of moisture quickly. Voight Contracting / Country Roads Ag-Hire not only supply natural Gypsum in bulk, yet also provide wet-plant hire of 4WD tractors with spreaders and tynes, ploughs and discs (full tillage range) to work the Gypsum well into the soil, ready for your use (such as grass seeding – another service Voight Contracting / Country Roads Ag-Hire can provide once your soil has been conditioned with the Gypsum). 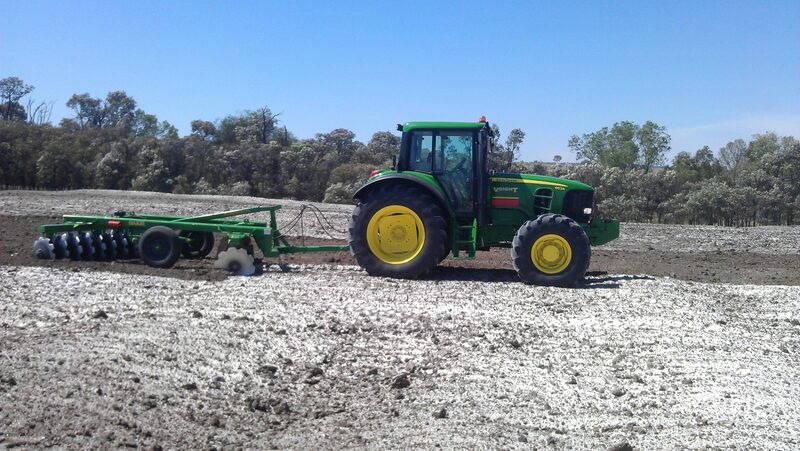 Conditioning the soil with Gypsum changes the soil structure from big clods to a fine, easily worked texture which makes the soil easier to work with for cultivation and improves drainage. Gypsum also releases minerals within the soil structure from the clay particles so that they become available for plant nutrition. Before incorporating Agricultural Gypsum into sodic soils, the Sodium causes swelling and dispersion of clay, which has symptoms such as waterlogging, increased runoff, poor water storage, surface crusting, and problems with cultivation and erosion. The clay particles may then move through the soil, clogging pores and reducing infiltration and drainage. The calcium from gypsum displaces the sodium which can then be leached deeper into the soil. Hard, compacted soil then becomes open, workable soil. By improving the soil structure, water penetration and aeration increases. Additionally, improving the quality of the drainage capacity for wet soils decreases the risk of root rot and improving the uptake of the soil’s nutrients, and the effects of Gypsum are long-lasting. Natural Gypsum is a powdery natural mineral (calcium sulphate). At Voight Contracting, we use a high quality gypsum, and supply thousands of tonnes each year on civil, remediation and rehabilitation sites to improve soil conditions and yield. We have trucks capable of delivering high grade quality gypsum by the tonne, as well as wet hire of tractors with spreaders designed to spread the gypsum as you require. We are currently involved in Gypsum works on major projects in Miles, Roma, Brisbane, Gold Coast and Chinchilla, and our experienced staff can provide useful advice on how gypsum can be applied to your site or pasture for improved soil and growing conditions.